Water weighs 8 pounds per gallon. If that doesn’t sound heavy, you’ve never been hiking in the desert with a day’s worth of drink on your back. I grew up in the Appalachian Mountains, but I didn’t learn the weight of water until I moved to New Mexico, where water is rare and precious and worth its considerable weight in blue gold. 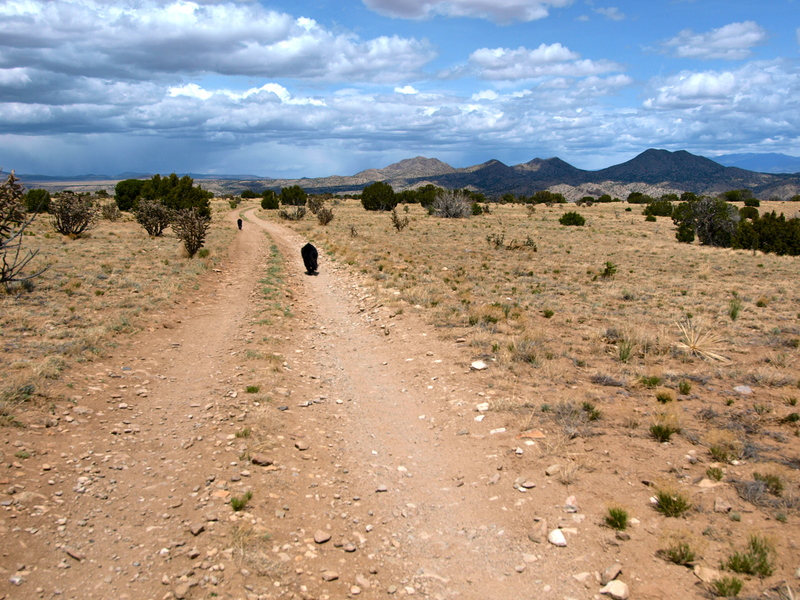 In New Mexico, I lived off the map, caretaking a place in the wide open deserts just south of Santa Fe. This place was more than a house. It was an Earthship: an off-grid passive solar adobe, adrift on acres of land. The house wasn’t connected to the outside world by wires or pipes, only a long dirt road. My power and my water both came from the sky and if I wanted to run out for milk, it was a two-hour round trip into town. The Road to Town. Santa Fe is hiding behind the Cerrillos Hills. The Earthship was an isolated place, but it afforded rare freedoms. Out there, I could hike in any direction to the horizon, down endless paths across open country. Between the trails, the place was wild, undulating madly in plunging arroyos and tilted sandstone. On foot, my favorite way to travel, it was a tremendous, uncharted place. As well as I came to know the landscape around me – its contours and secrets – so I came to know myself: I knew exactly how much electricity I burned in a day, how much water I let drain in a shower, how quickly I went through a bag of beans, how long I could go before I pined for town, for Santa Fe’s bright colors, its rush of voices, the thrill of a menu, a taste of the outside world. Often, weeks would pass without wanting to be anywhere but out there in all that free open space. 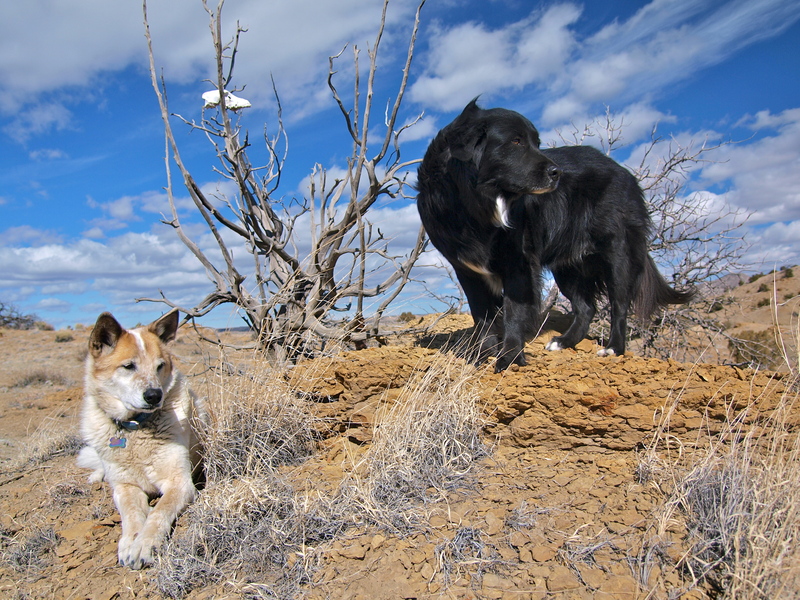 Desert Treasure: The Blonde Coyote & Bowie with the coyote skull I found wedged in a dead juniper tree. Living in such a wild, remote place has its challenges, the greatest of which was the lack of free-flowing water. The Earthship had no water source – no water lines, no well – other than the sky. The building’s metal roof could collect hundreds of gallons of water during a good rain, the water gushing noisily through the gutters into two 1500-gallon water cisterns buried beneath the house. 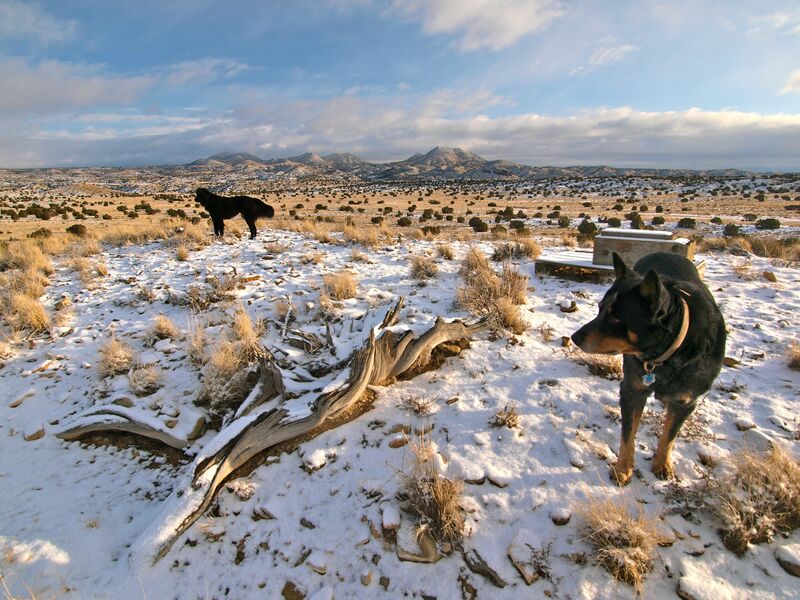 Of course it doesn’t rain much in New Mexico, on average less than twelve inches per year, mostly in late summer (this year, so far, has loosed less than six). During dry spells I called Joe, a Navajo with a big red truck that dragged an old wheeled water tank. Joe charged $40, cash, for 400 gallons of water, delivered. I mostly used the cistern water for the Earthship’s sinks and shower – the grey water that flowed down the drains went out to water the plants and to fill the toilet – and bought drinking water in 5-gallon reusable jugs. On average, I used around 50 gallons of water a week. The average American household drains more than 350 gallons of water a day. 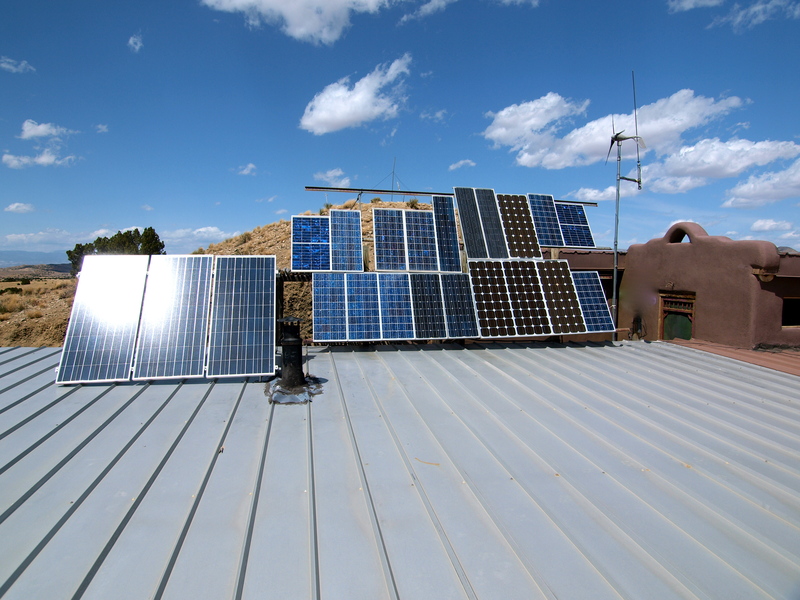 The Earthship’s solar array and rainwater catchment roof. On three occasions, twice my first winter and once last year, I turned on the tap and nothing came out. That was when I learned the true weight of water. When nothing comes out of the tap but a desperate gurgling noise, the weight of water is crushing. Suddenly, four walls, a roof, and plenty of food all mean nothing. Without water, you have no home. In the desert, without water, you have nothing. Visitors to Santa Fe seldom know the weight of water, but they’ll soon memorize those ubiquitous signs above every sink in the city: Water is a finite resource, please conserve. What effect the signs have on people, as they stand at the sink, washing their hands, brushing their teeth, I don’t know. What effect they have once people go home, to places richer in water than New Mexico, is even less certain. I know when I stand at a sink where the water flows free, I am thankful for every drop. Perhaps every now and then, taps in Santa Fe should run dry with an empty, ominous gurgle. Then perhaps more people would feel, know and remember the true weight of water. I have been away from the Earthship’s extreme asceticism for nearly nine months now, enjoying a winter back east, closer to my roots. But even here, the sound of rain on the roof in the middle of the night is enough to jolt me out of a deep sleep, anxious to check the gutters on the (now nonexistent) rainwater collection system. Every time I turn on the tap and water flows freely, I think of the desert and the awful, crushing desperation of running out. I hope I will feel the weight of water for the rest of my life. This essay appeared last week on HospitalityGreen’s blog. Over the next 12 months, HospitalityGreen LLC, a New York-based firm specializing in environmental and operations consulting services and founder of the nationally recognized Green Concierge Certification program, will provide technical assistance, green team training and customized coaching free of charge to 15 lodging providers in Santa Fe in an effort to encourage better water conservation and reduce the amount of chemicals and other pollutants released into the environment. Read more about the initiative here. 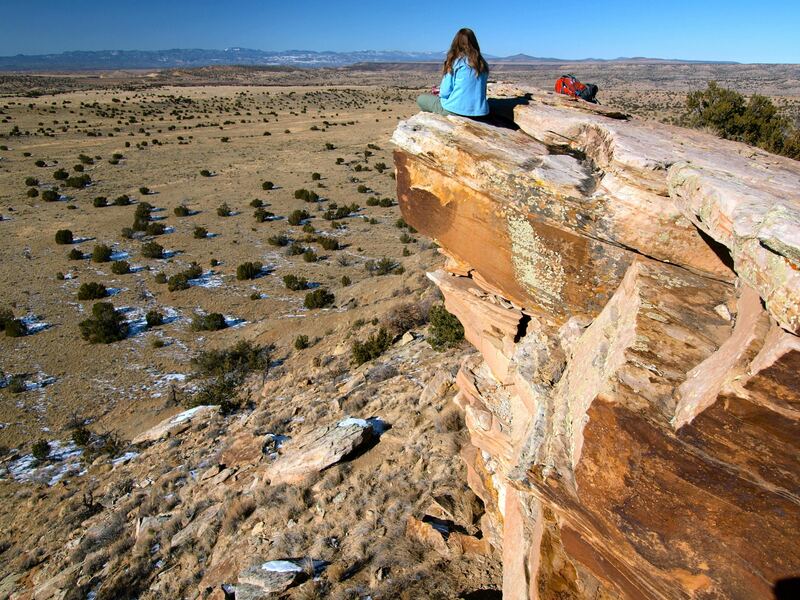 This entry was posted in Hiking!, New Mexico, Photography, Sustainable Living, Uncategorized. Bookmark the permalink. Wonderful!!! Would it be possible to print a copy of this for the tourists that wonder why Madrid is full of Port-O-Potties and you have to sit down and place an order at a restaurant to even be allowed near an indoor bathroom? If not, I certainly understand. People really have no idea that when they visit the desert they are visiting the DESERT; water is our most precious resource out here. Sorry I took forever to respond. That would be great, if you don’t mind 🙂 Greyhoundgrrrl(at)hotmail.com Thanks! I totally understand what you are saying about the water, even though we live in the foothills of the mountains. We have solar panels for electricity and two water tanks to catch our rain water – when it rains. We probably get more rain here than you did near Cerrillos, but even so, we celebrate rain! Grey water is used for outdoor plants and toilets, just as you did. Occasionally we have to have water delivered, but mostly we get by with the rain water – and it is precious, indeed. Yes, very dry. We got caught in the monsoons in the Pecos Wilderness when we backpacked to Pecos Falls in July, so there rain in the mountains, but not so much rain down in the valleys. At Christmas we went to Carlsbad Caverns, camping at Brantley Lake State Park. The southern portions of NM seem especially hard hit. The reservoir at the state park was a mere fraction of what it was a couple of years ago when we were there. It was a challenge to find anything interesting and worthwhile to take photos of. You probably heard about the huge fire in the Gila Wilderness – biggest fire in NM recorded history. Great writing. The desert is just “pictures” to most of us, but the weight of water is real after reading this. Sharp. Thanks for a great article. Living in the dry Colorado mountains I am used to using little of the precious stuff. I wish all could be so concerned about our only real need, water! It gives life to all it touches. Thanks for sharing your experiences. I’ve lived in a fairly temperate climate my whole life, but last year my region had a terrible drought. It saddened me to see the dying plants – I’d never seen trees going yellow before fall. beautiful and totally impressing! 🙂 Love that! I truly understand your respect for and understanding of the water issues of New Mexico, having lived on the Embudo River in Dixon for 5 years and now live in SW Colorado and Arizona. I have been writing and doing artwork related to water recently as I believe in immersing oneself in the place where you live and understanding it as best as possible. Glad you posted this. Stumbled accidentally into your blog… but then again accidents really never do happen… moved to Oklahoma from California in 2012 to start building an earthship on 40 acres… enjoyed this blog about the worth of water immensely and wish you the best in your travels this year…. Very cool, Roban! Are you building it yourself? Beautiful post. It really makes you think. Sustainability is so important and it’s so easy to forget the importance of something that we use every day without giving it a second thought. Thanks for bringing this up! Thank you for an interesting blog. I had the pleasure of staying in an Earthship near Taos last year, and it was quite an eye-opener. And after the massive drought this year, it’s becoming very clear that sustainability inevitably means water sustainability. Hopefully, we are slowly realizing the consequences of ignorantly excessive water use. Hopefully we’re starting to think twice about flushing clean ‘blue gold’ down the stool. Eloquent and pertinent. An essay on the worth of water that is more than worth a read. Having lived all my life where running taps are plentiful, your essay has made me so much more aware of the weight of water. Thank you. Reblogged this on frilia wg. Love your dogs, love your photos. I need to learn to love water more. “I knew exactly how much electricity I burned in a day, how much water I let drain in a shower, how quickly I went through a bag of beans,..” Most of us, including me, think little about the amount of resources we are currently using. I will be conscious – at least for a day – maybe longer. Your post is the wake-up call we need as a daily reminder. We were always brought up knowing water was rare and precious – so it was odd to move to the UK and be ‘allowed’ to water my garden in summer. Agree with Mark’s comment on ‘blue gold’ and the need for us to respect it far more than we do. Hi Mary, I loved this post. I live in Ireland and I am studying geography in college. I absolutely hate how much water is wasted here! Even though we have plenty of rain, a lot of our tap water comes from ground water sources, talk about depleting the aquifer! There is lots of talk about passing peak oil but no one ever mentions the prospect of peak water. Needless to say I enjoyed this post – liked and followed. What a wonderfully spare existence, one that redefines our concepts of what is “enough” and “not enough.” Poignantly expressed. I read every word of it and it was great, I kept thinking “If my wife would just read this” she drives me up the wall in the kitchen standing at the sink ….. and …. Oh well, you know the rest. Just the other day I was reading something and they were lamenting the fact that it was raining where they were which all of us in Oklahoma would gladly take without complaining some many years into a devastating drought. Good reading on a Thursday Morn. Copped me a subscription and I will follow you for the rest of the series. very interesting, thanks for sharing, fascinating! it’s easy to forget how precious water is when we’ve had one of the wettest years on record here in the UK. The rain has been destructive in some places but will have certainly topped up the reservoirs. We have so much rain, yet we never harness it on a house to house level. Wonderful post and writing. And photos! Drought in one place means floods in another… we all live under the same sky; we are all connected. This is a beautiful post. Thank you so much for sharing your experiences. I have a much better appreciation of my easy access to clean water, now. Amazing photos and wonderful post! Thanks for making us realize how much water we need to conserve everyday. Today we’re lucky enough to have a sustainable water supply. So we must learn to conserve it before it’s too late! OMG I MISS THE DESERT!!!!!! Thank you for the beautiful pictures!!!! I just moved to Vancouver, but was raised in Los Angeles. The desert was always my solace!!!! I miss it so much!!!! And I LOVE the Blonde Coyote + Bowie!!!! Some of us and myself included take a lot of things for granted especially those that we would never think we’d ever run out of. Water is a life line. It’s precious. This was a fantastic read! And so informative. Great work! I would love to do what you’ve done. I love the Earthships in New Mexico, and I would love to experience the beautiful desert the way that you have. Thank you! I’ll definitely look into that. I dream of living off the grid some day. Slowly, I have seen more people here in the N. East hooking up rain barrels in the warmer months. It makes me happy. Great piece. So important, well written, with amazing photos. I personally know what it’s like to get stuck in the desert with no water! Now I live in a ‘developing country’, where I take cold showers, and not that often. I know there’s a million folks in the States that never think of this stuff. Glad you’re sharing your story with organizations that are doing what they do. Thanks, Bani! Once you step outside this country you realize that long, hot showers are a luxury! Too many people take them for granted here. Great writing!! I just came back from India and I appreciate clean water a lot more. But having no water is a whole new level. Thanks for sharing. This is a really great essay! I am happy to have stumbled upon it! I have NEVER met anyone who did not live off of rainwater. How could you live without rainwater? As short as it was, this post read like a book. A book that you want to read because every page keeps you glued to it (not just because you want to know how it finishes; perhaps something like Prodigal Summer by Barbara Kingsolver). I did not know while I read it that you were a writer, but it certainly does not surprise me! Good luck with your journey to Alaska! Such a great article. We are spoiled with plentiful water resources in Canada, hopefully they remained as pristine as the majority of them are currently. Water conservation is such an important issue, and will only continue to be more important over time. Very beautiful pictures! love you dogs! Thank you for this–it is wonderful. The efforts we put into conservation in our home now seem so paltry. A good dose of reality makes me feel so rich. Great post. We live in southern colorado and while we have a well these dry years are frightening. Wild fire doesn’t care if you have a well or not. Water awarness is a way of life for those that are not supplied by a city. Sadly those that live in the cities are not. Don’t get me started on fracking! I make friends with water, I have promised to love and protect it. I re-use it often, and haul it around, from the tub to the garden. Great exercise. I began this because it was something simple that I could do to protect the environment. Thank you so much for your essay! Love your blog title and photography! You really captured the essence of the New Mexico landscape. If you wanted to check out what the high desert in AZ looked like a couple weeks ago (quite similar) – stop by at unpackedwriter.com and check out “Ascent into the New Year: Flight testing….” ! I’ll be back when you post more! The blonde coyote is beautiful! As for Americans and their wasteful tendencies, I believe everyone should live in a remote place without the ease of electricity and/or water just to help expand that understanding of the ways we NEED to adapt to conserve. I try to be as conscious as possible when using electricity and water; I despise waste! Hell, I live in one of the most moist regions of the world, where water flows in abundance, and I still force myself to be respectful and conserving of mother’s nectar, along with food and materials! This post reminded me of much of my own life in the Land of Enchantment. 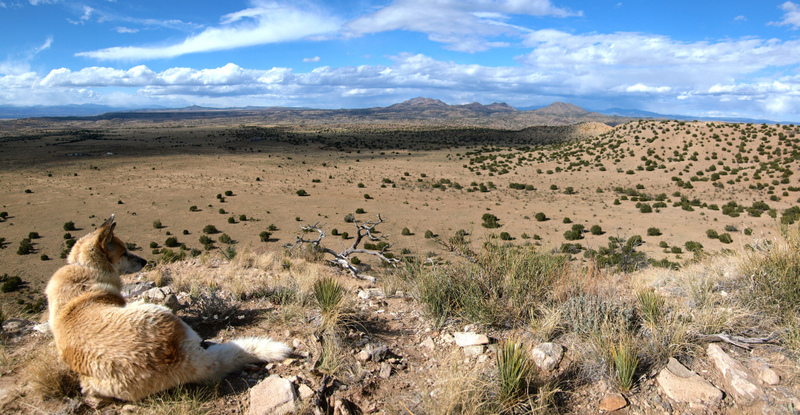 I’ m familiar with and have spent a lot of time in Cerrillos, mostly hunting turquoise but also making movies. In the high desert you learn to be water wise, as we should be everywhere. We can easily – with some adjustment – libe without oil, but we cannot survive without water. This is what far too many people don’t realize. Reblogged this on The Old Nikon D40.